At the 2019 Game Developers Conference, you can look forward to an array of talks from speakers across the video game industry. During the week, you'll hear from industry legends, niche experts, and amazing advocates, many of whom will want to learn about you and your work as much as you do theirs. 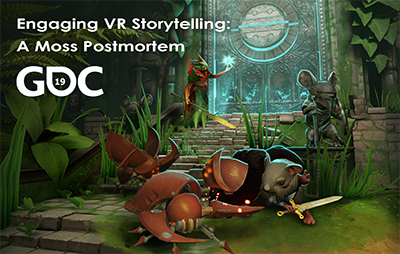 During this year's conference, Polyarc artist Corinne Scrivens will be leading a postmortem of Moss, Polyarc's VR game starring an adorable sign languag-speaking mouse. To introduce you to Scrivens, and let her explain why you should attend her talk, we reached out for a quick Q&A you can now read below! Would you please introduce yourself and talk about your role in game development? Hello! My name is Corinne Scrivens and I started working in this industry 8 years ago. With my art background and my love of story I became a Character Artist. Previously I worked on characters at ArenaNet and Bungie for games like Guild Wars 2 and Destiny. I’m probably most well-known for helping craft memorable Destiny characters like Eris Morn, Amanda Holiday, Hawthorne and others. Currently I’m a Principle Artist at Polyarc, where in addition to character art I get to work on and learn about other aspects of game development outside of my normal field of work. Without spoiling it, what will you be talking about at GDC? My talk is a postmortem for the story of Moss, our studio's debut game. Moss is a VR game created by a small team of 15 employees in just 18 months. I go over Polyarc’s approach to crafting narrative and how our constraints shaped how we delivered our story to our players. I will also cover the principles we used for figuring out how to develop for a new medium like VR and the strategies we used for creating our game with a small team and short deadline. What excites you most about the future of game development? When we first started on Moss, we had no idea that players would feel such a powerful connection to our little hero. VR provides us with the ability to craft a character relationship that was much stronger than what is possible in traditional flat screen development. With VR, AR, MR, and the other new mediums there are a lot of new frontiers to explore, each full of unexplored possibilities. I’m excited to see what other discoveries are out there to be made. Tell us about your favorite project you worked on in the last year. Moss is a single-player action-adventure puzzle game and new IP tailor-made for the VR platform. In it, the player finds themselves summoned to help Quill, a young mouse with dreams of greatness beyond the confines of her small and tranquil village. Quill must embark on an epic journey—and she needs you there by her side. Together, you'll travel to forgotten realms, solve challenging puzzles, and battle menacing enemies. Alone, no one can conquer what you're up against. But united, you just may defeat even the darkest of villains. Attend GDC 2019 and get a data-driven look at why people play games! Here's a few of the games you'll see at the GDC 2019 Experimental Gameplay Workshop!